Several years ago I was introduced to S.W., one of my mother’s high school classmates. We’ve been friends ever since. S.W. and I enjoy going to classical music concerts, movies at independent theaters, museums, and dinners at ethnic restaurants. S.W. and I have made plans to get together in the near future. However, as the date grows near, I am filled with such trepidation that I think about postponing the meeting or canceling it altogether, not because of anything personally involving S.W., but because of something she has in her possession: a copy of the latest revision of my manuscript. S.W. is not only a friend, but a retired editor at one of the country’s top educational and general interest publishing houses. Her ability to shepherd a project from raw manuscript to award-winning literary treasure is legendary. S.W. didn’t put her sharpened Ticonderoga Number 2’s back in the pencil case when she retired. The woman whips through the New York Times crossword puzzle before her first cup of morning coffee has cooled. She’s been known to call television news reporters on the phone and scold them because they misplaced a modifier during a live report. And those reporters thank her profusely for doing so. Two years ago I handed S.W. my manuscript and when I got it back it was covered in so much red ink and post-it notes that I thought I’d need a defibrillator to bring my story’s characters back to life. After spending a month decompressing, I read through her edits, which I largely agreed with, and went back to work, confident that I could make the story much better. Now that I’ve handed it back to her again, I feel ill at the prospect of seeing her for our meeting. Who knows what she’ll do? Maybe I’ll need a fire extinguisher to hose the pages down. But it’ll be okay. I value her skills. S.W.’s level of editing is exactly what I need. This entry was posted in Writing and tagged editor, manuscript, publishing. Bookmark the permalink. I could feel your anxiety level about showing S.W. 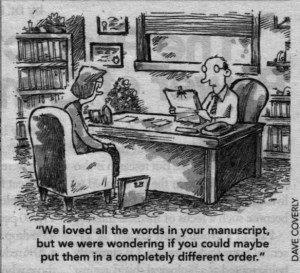 your manuscript. Since I actually met and experienced S.W. this weekend, I had a greater appreciation for your story.